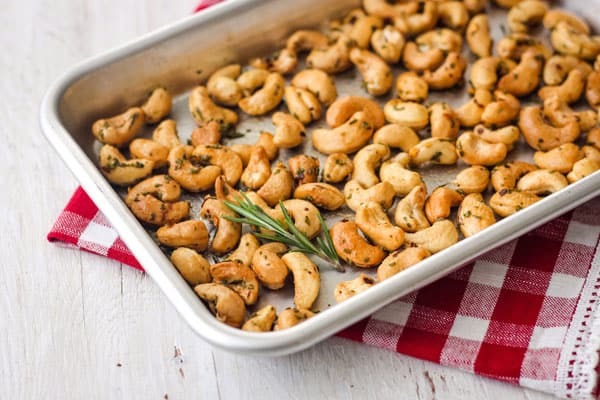 Rosemary Cashews - A Small Batch Recipe For Your Toaster Oven! 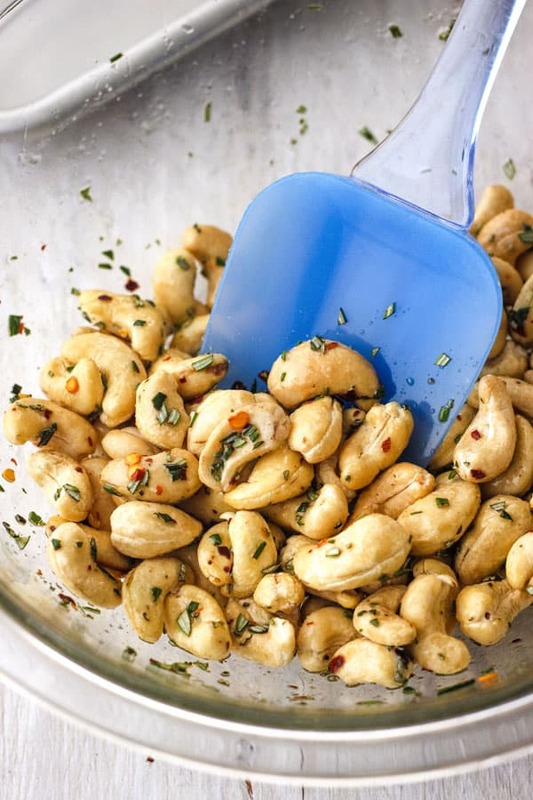 Rosemary cashews are an irresistible snack that’s loaded with savory-sweet flavor. Use your toaster oven to make this small batch recipe, it’s so easy! I’m a sucker for salty snacks, but self-control around them has never been my strong suit. 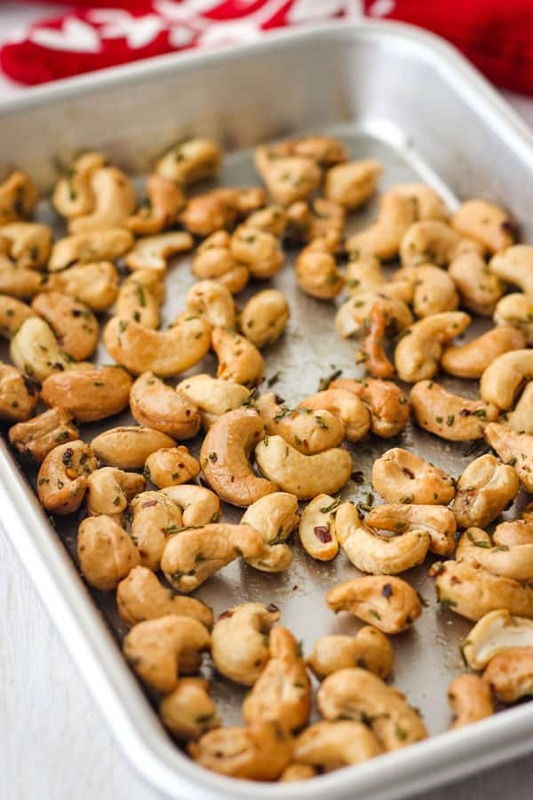 So a big pan of seasoned nuts…that’s just a bellyache waiting to happen. Maple syrup aka The Good Stuff. I’m talking PURE maple syrup, none of that corn syrup business. It’s just a few teaspoons and friend, you are worth it. Sea Salt, because always salt. 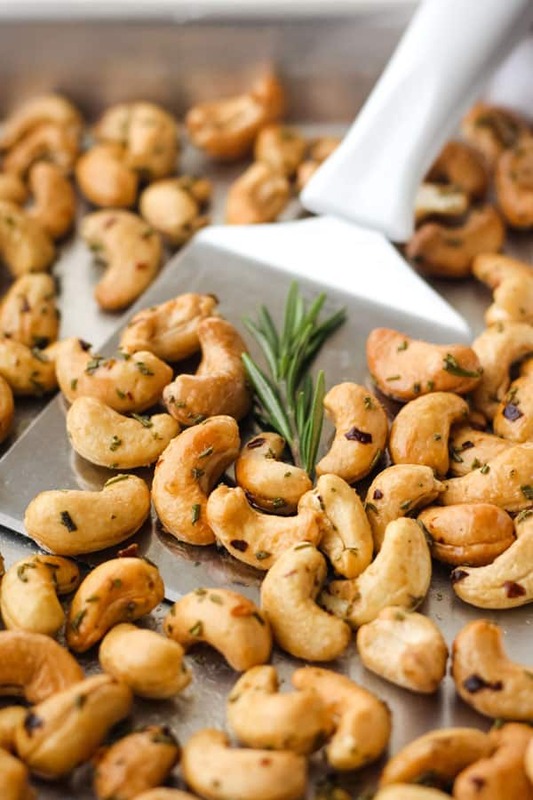 Plus it helps to balance the butteriness of the cashews and highlight the other great flavors. First grease a light colored small baking sheet with cooking spray and preheat your toaster oven to 325 degrees F.
This Nordic Ware 1/8 Sheet Pan is my new favorite mini pan. 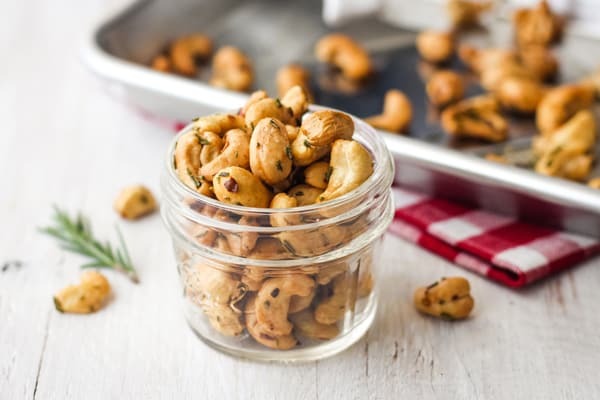 It fits in our smallest toaster oven and is perfect for making a batch of nachos for one, toaster oven grilled cheese sandwich or rosemary cashews! The exterior of the pan measures 10″ x 7″ x 1″ and I love that it doesn’t warp at high temperatures. If you want to add this pan to your kitchen you can use this affiliate link to purchase it on Amazon. 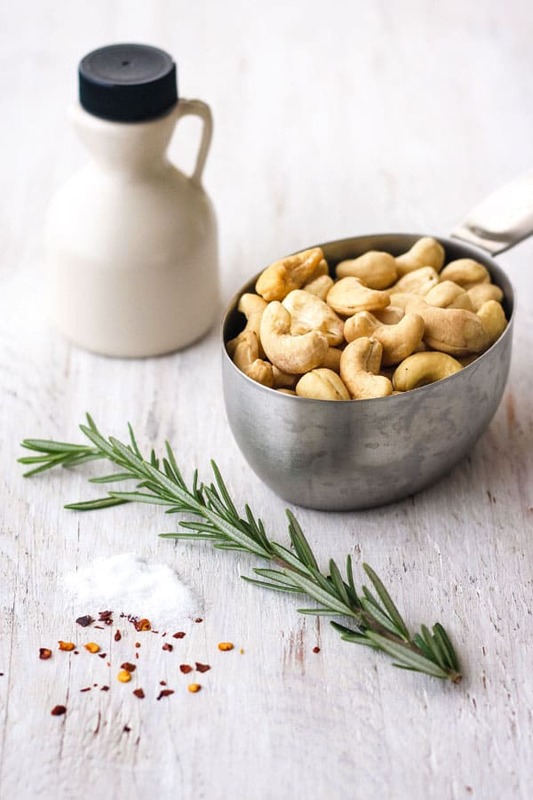 Next, dump the ingredients into a large bowl and mix until all of the nuts are coated. Pour the nuts onto the pan and spread in an even layer. Make sure to scrape the bowl so you don’t leave any of that good stuff behind. All that’s left now is to pop them into your little toaster oven to bake for 14 to 18 minutes. You’ll want to give them a stir after 7 minutes and again at the 14-minute mark. 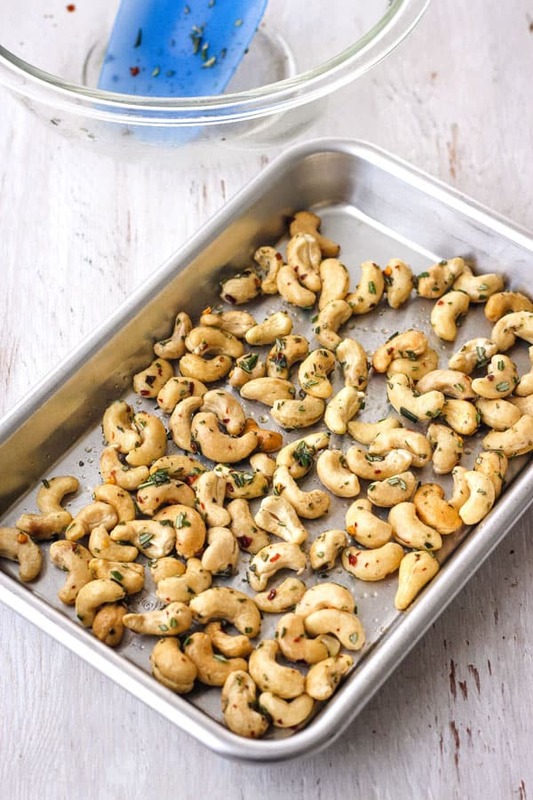 Keep checking on them every minute after that since cashews tend to burn easily. How to Store Fresh Rosemary? If you’ve got leftover rosemary, take a few minutes to refrigerate or freeze that extra rosemary so it lasts! Then you can use it to make toaster oven rosemary potatoes, roasted sweet potato rounds or seasoned toaster oven baked pita chips. Woo-hoo! Congrats on your new toaster oven, Ross! I think you’ll like having a smaller pan in your collection, it doesn’t take up much space (which I know is a priority for you guys) and it’s great for all those little cooking jobs.